What an interesting name? Some strategies have unique names. Whenever I think of Iron Condors, the group Iron Maiden somehow pops in my mind. Not sure if they trade options? What is an Iron Condor? An Iron Condor is simply an out of the money call credit spread combined with an out of the money put credit spread. An example is listed below. With RUT at 726.81, we sold the 610-620 put credit spread and sold the 810-820 call credit spread. The call credit is $1.55 and the put credit is $1.35. The total credit is $2.90 or $290. What is the risk in this example? If RUT goes to zero, the put spread goes to 10 (difference between the strikes) and the call spread goes to zero. 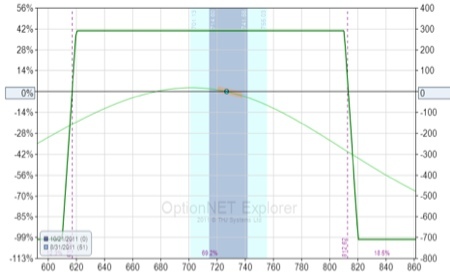 This results in a $10 loss from the put spread offset by our credit of $2.90, and that equals a total loss of $7.10 or $710. Dan, are you telling me that I can make $290 if it works but lose $710 if it doesn’t work? Yes! Dan, why would I do it? You have great probabilities in your favor and if you limit your losses , this can be a great long term strategy. Dan, how is this a good probability trade? Step 1: the delta of the short call you are selling is around 16 and the delta of the short put you are selling is 16. Step 2: Add the deltas of the short puts ( 16 + 16 =32) and subtract from 100 to get the probability of success at expiration. In this example it would be 100-32= 68% probability of success at expiration. Is this totally perfect? Of course not, but good enough for government work. OK Dan, what about the big question, how do I avoid losing $710 when I am only making $290? The answer is under the umbrella of Risk management. You need to take off the spread when you are down much over $290. You can’t make $290, 3 months in a row, which you will at times because of the probabilities, and then have a big $710 loss. From a business point of view it won’t work. Some folk might say, “ Dan, I would be more comfortable with a little less probability to get a better risk reward”. How would I answer those folk? The answer would be to do credit spreads where the delta of the short options are closer to 20 or 25. This would give better risk reward and a little lower probability. Someone else might say” Dan, I would like higher probabilities and more room, what should I do?” The answer would be to do credit spreads where the short deltas are 8-10. This would give probabilities over 80% at expiration but stinkier risk rewards. The most important principle for long-term survival with Iron Condors is this: Don’t lose much more in a losing month than you make in a winning month. You can’t win 3-4 months in a row and then get clobbered and give it all back. That’s called trading without a plan! I might get more specific in future blogs, but this is a start on the strategy we call Iron Condor.